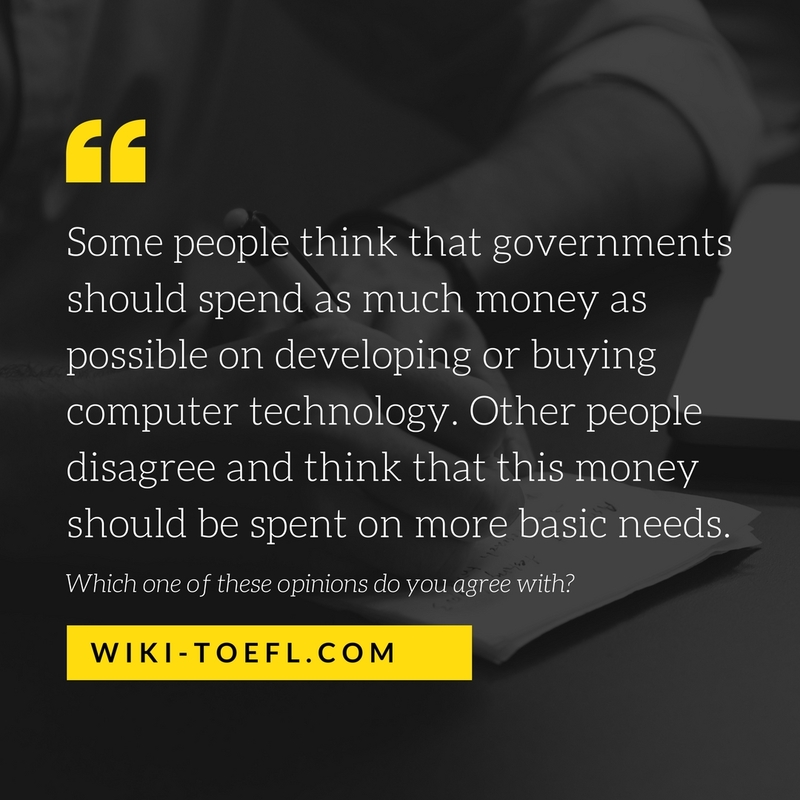 TOEFL iBT Essay Topic 001 Some people think that governments should spend as much money as possible on developing or buying computer technology. Other people disagree and think that this money should be spent on more basic needs. Which one of these opinions do you agree with? I realize that it’s important to stay up to date with our technology. So much, like our space and defense programs, depends on it. I’ve also read that we shouldn’t let other governments get ahead of ours in the race for better technology. This could eventually put us at a disadvantage and our whole economy could suffer. Despite all this, I think our government should spend our tax dollars on more basic items before it gets into the business of developing computer technology. could solve a major problem like that, wouldn’t it improve our society even more than new technology? Another problem is that our transportation system is falling apart. Bridges have cracks in them. Highways buckle. Accidents happen because of these problems. We shouldn’t put money into improving a computer chip when we have basic needs like these. Besides, why should the government be in the business of developing technology? Aren’t there several very successful corporations doing just that? Yes, it’s probably less expensive in the long run for the government to develop-the technology. Nevertheless, in the short run, there are basic needs in our society that aren’t being met. I think that’s where the money should go. Some people think that government should spend as much money as possible on developing or buying computer technology, while others do not. As far as I am concerned, this money should be spent on some more basic needs, such as protecting the environment and improving the public service. improve their public transportation, which will benefit their people a lot and benefit them instantaneously. Man, through the ages has undergone many changes from the time when he depicted a herd of mammoths on the walls of a cave to nowadays when he can chat with anyone across the sea by use of modern means of communication. Some people think that in today’s world government should spend more money on computers. However, others think that it is inappropriate and the government should spend more money on food and shelters for poor people, medicine, education, etc. These two options are very different and controversial. But I think that developing computer technology brings people more advantages than they think it does. First of all, humankind nowadays more and more depends on computers. We often do not suspect the presence of computers around us. For example, when we withdraw money from cash machines, get some gasoline on the gas station and pay with our credit cards in the stores. So, nowadays computer technology plays an essential role in our everyday life. Second, computer technology brings more job opportunities. For a country, the computer technology means power, knowledge and constant development. In addition to those practical benefits, the development of computer technology brings a lot of money to the country. From the other side, the government should not forget about poor people, who can not afford computers but need food and shelters. However, I think that computers help people gain more knowledge and experience and find a job to provide food and home for his family. So, basically, computers give people the opportunity to reach their goals and be innovative. To sum up, I think that computer technology gives people many benefits including the opportunity to improve one’s knowledge and be more self-confident, persistent and experienced in this world. Who has not listened to the common statement that health is first from other needs? Think about it and you will maybe realize that this is true. According to the pyramid of needs for people; primary needs, which are for example health and food are above other needs denominated secondary and sumptuary ones. This pyramid states that it is most important for humans to satisfy the needs which are first, in that order for be good and happy. By this mean, technology should be considered by governments a lesser level of need when it distributes its money. Though many people think that governments should invest its money in order to develop its technology, I strongly believe that governments should spend its money on more basic needs of its own people because this money belongs to them, many people die from hunger and health is a main issue which government must take care. First and foremost, where do governments receive this money to spend from? Yes, it is true that from its own governed people, which it earns by taxes, for example. Remembering the pyramid of need stated in previously, is not true that people would be better if their basic needs were satisfied? Governments should spend its money, which really belongs to its people, in order to satisfy their main needs not what governments think it is much better. Buying or improving technology could not make all the people happy, due to everyone has different needs. But the main needs are universal, thus everybody wanted to get these principal needs satisfied. This is a right that the people have over the money which is spent by governments, due to the fact that these governments just manage it. Secondly, hunger is a large problem which is present over the world. People die because food does not reach them and there is no correct split of revenues of a country. For this reason, when governments start to think how to spend its money, they should think first in satisfying the hunger of its people in order to stop these deaths and improve the quality of its people’s lives. Last but not least, hunger is accompanied by health. Everyone wants health for their family instead other needs that they want to get. Although governments always say that health is for everyone in its country, this is not completely true. Wealthy people get the best treatments available in a country and it is usual that poor people do not achieve a correct treatment or even a medical prescription due to there is not enough doctors and facilities for everyone. By this mean, governments should focus not just in food for people but in maintaining its people healthy. In a nutshell, for all these factors, we can reach the conclusion that although some people think that it is much better that a government spends its money in improving technology, because they probably think this fact will facilitate our lives. Personally I believe that it is much better to invest this money in principal needs as health and food.